This isn’t a one-time limited time thing. The book is now free and will continue to be free. Download your copy on your favorite ebook reader or via PDF (with no registration required). I define a World Wide Rave as when people around the world are talking about you, your company, and your products. It’s when global communities eagerly link to your stuff on the Web. It’s when online buzz drives buyers to your virtual doorstep. And it’s when tons of fans visit your Web site and your blog because they genuinely want to be there. Since one way to generate a world wide rave is to offer something of value for free, I thought making the book totally free made sense. I want to thank Shannon, Peter, Matt, Elana, and Brian at my publisher John Wiley & Sons for working with me on this project. Most publishers would flat out say "no way" to an authors request to make a book free. My friends at Wiley totally get the value of generating attention in this way. They understand that because more people will know my work they will consider purchasing my other (paid) books. That understanding of the new realities of publishing is why I've done my last 5 books with Wiley. There is a significant amount of work required to coordinate with Amazon (for Kindle), B&N (for Nook), Apple (for iTunes) and Kobo is takes a lot of work. Thanks guys. Download your copy on your favorite ebook reader or via PDF now. And please pass this offer on via your social networks. 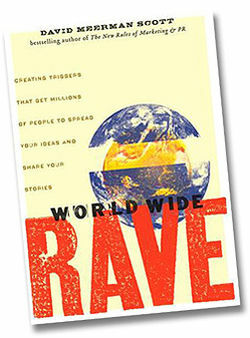 More information on World Wide Rave here.